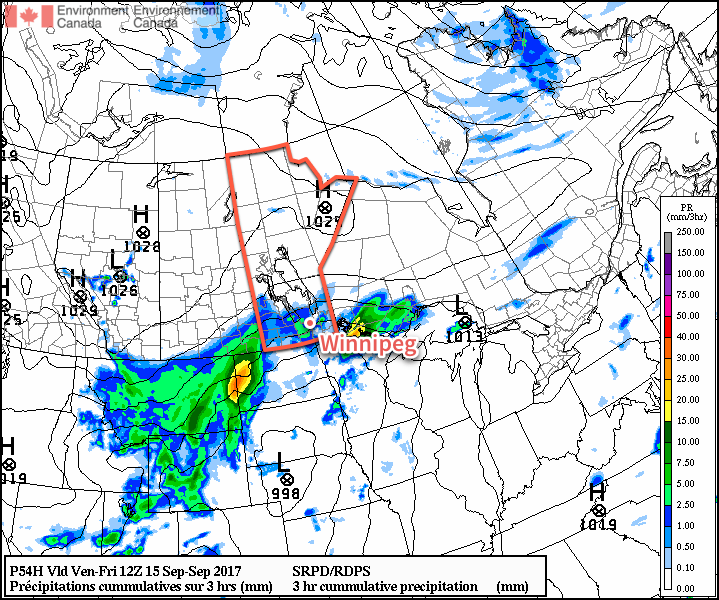 Winnipeg will see the weather slide from September Summer™ to seasonal to cool and rainy over the next few days as a developing storm system in the Northern Plains gets set to bring a major pattern shift to southern Manitoba. 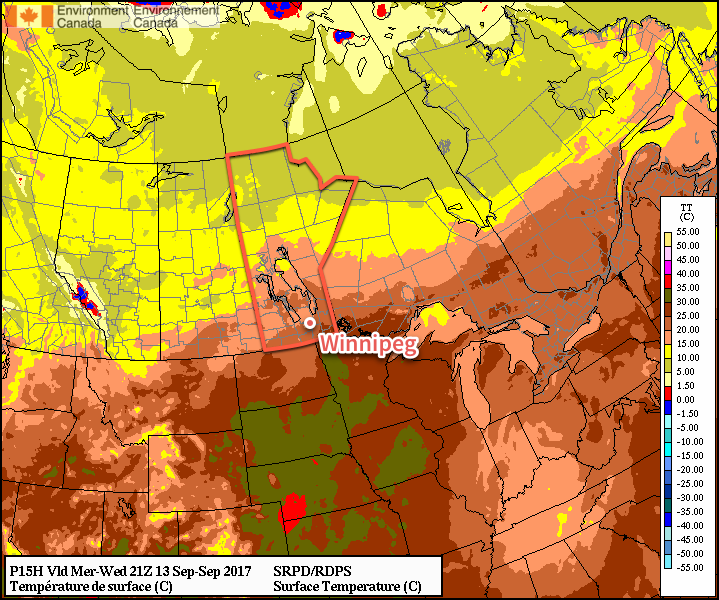 Today will continue the September Summer™ for Winnipeg and the Red River Valley as daytime highs climb well above-seasonal into the mid-20s under nothing but sunshine. Winds will be fairly light today too at just 15-20 km/h, making for a gorgeous day. Some cloud cover will move through tonight as temperatures dip to a low near 13°C. Thursday will see the beginning of a major pattern change as a major low pressure system gradually organizes through the northern plains of the United States. As it does so, a northeast wind to 20-30 km/h will begin tapping cooler air from the central Prairies, returning near-seasonal temperatures back to Winnipeg and the Red River Valley. Skies will be mixed with increasing cloudiness overnight. Friday’s dominant weather feature will be a trough of low pressure developing across central North Dakota into southeastern Manitoba in response to a low pressure system tracking into Nebraska out of Wyoming. This trough line will support the development of a large area of rain that will spread northeastwards from western North Dakota along the trough, likely arcing through southwest Manitoba and across the Red River Valley into the Whiteshell. This feature has all indications that it will be a prolonged rainfall event, with rain beginning Friday morning and continuing into Saturday morning. Total rain will be variable and dependant on whether or not any embedded convection develops, but general amounts of 20-30 mm look quite likely. With all the rain, temperatures will be quite cool with highs well below-seasonal in the low teens. Unsettled weather will continue on Saturday with improvement on Sunday, but the chance for more rain will return on Sunday night into Monday morning. Temperatures will remain below-seasonal through the weekend. Into next week, temperatures will return to near-seasonal values, but it looks like there will be multiple chances for rain as several disturbances cross the Prairies. Winnipeg’s seasonal daytime high is currently 18°C while the seasonal overnight low is 6.